This lightened-up casserole is still creamy, rich and out-of-this-world good! 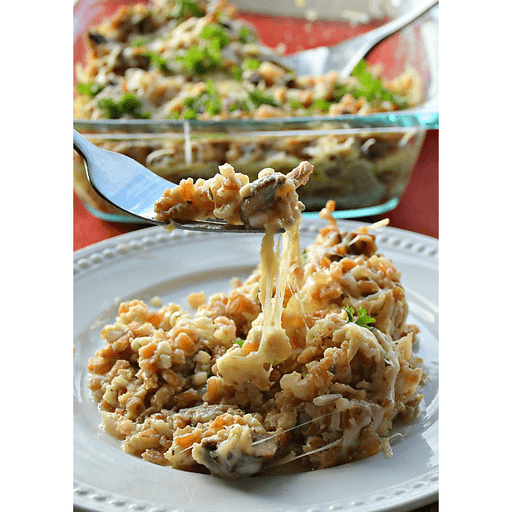 With savory cremini mushrooms and nutty-flavored farro, this delicious and satisfying casserole will quickly become a family favorite. 1. Heat the oven to 350°F. Spray a 1 ½-quart casserole dish with cooking spray. 1. In a 1 ½-quart saucepan, cook the farro in the chicken broth, covered, for 15-20 minutes or until the farro is tender but chewy and the liquid is absorbed. 1. Meanwhile, in a 12-inch nonstick skillet, heat the butter and oil over medium heat. Add the shallots, garlic, thyme and salt. Cook for 2 minutes, stirring frequently. Stir in the mushrooms. Cook for another 5-6 minutes or until the mushrooms are browned, stirring frequently. 1. In a small bowl, whisk the cottage cheese, egg and ¼ cup of the Parmesan cheese together. Stir the cottage cheese mixture and cooked farro into the mushrooms. 1. Spoon the mixture into the casserole dish. Cover and bake for 35-40 minutes or until thoroughly heated. Uncover and sprinkle with the remaining Parmesan cheese and the chopped parsley. Bake uncovered for an additional 10 minutes. For vegetarian: substitute vegetable stock for chicken stock. Calories 180, Total Fat 6g (Saturated 2.5g, Trans 0g), Cholesterol 35mg, Sodium 290mg, Total Carbohydrate 22g (Dietary Fiber 4g, Sugars 4g), Protein 11g, Vitamin A 6%, Vitamin C 4%, Calcium 15%, Iron 4% *Nutritional values are an approximation. Actual nutritional values may vary due to preparation techniques, variations related to suppliers, regional and seasonal differences, or rounding.